Radical Ideas for Financial Reform - Miata Turbo Forum - Boost cars, acquire cats. Without googling, would you think these come from a big government liberal? A smaller-government conservative? An anti-crony capitalism libertarian? My first reaction was that it reads more like someone on the political left wrote it, but I could be wrong. I've seen variations on those ideas from all sides, but the tone seems more like the left to me. EDIT: Just looked it up. I have a comment but I'll hold it if anyone else wants to guess at the source. EDIT (AGAIN): Now that it's been revealed, the source makes sense -- apparent "conservative" goals, generally accomplished via big government means. In other words, the mainstream center-right GOP. Last edited by mgeoffriau; 11-01-2012 at 09:45 AM. Based on the extreme diversity of the opinions offered, I'm not sure that I could affix a single label to the author of that list. I cannot think of any one school of political-economic thought to which I would expect the author to claim adherence. #1, for instance, suggests an almost Stalinist mindset. In order to forcibly "break up" a bank, you must either nationalize it or else manipulate the Justice Department in such a way as to force its divestiture by court mandate, which essentially amounts to a slightly more velvet-glove treatment of the same thing. (This is how the Bell Telephone System was broken up in the early 80s, stemming from a DOJ antitrust prosecution originally filed in 1974.) Either way, you are greatly exceeding the boundaries of the Constitution with regard to the limits of the Federal government, with or without the Interstate Commerce clause. #2 is stereotypically ultraconservative / tea-party. Decrease government spending, decrease government involvement in private enterprise, etc. #3 and #4 are fundamentally compatible with a traditional "big government liberal" perspective, in that they espouse increases in the regulation of commerce and a corresponding decrease in the ability of the ability of the financial market to function as a "pure capitalist" mechanism. #5 is hard to place, as it's sort of self-contradictory. It incorporates elements of "small government" thinking (decreasing the involvement of corporations / SIGs in policymaking will inherently tend to streamline regulation and decrease volume of policy which is made), while at the same time requiring that "big government" regulations be put in place in order to limit the freedom of of the specific individuals involved in corporate governance. This could be construed as going so far as infringing upon the first amendment, vis-a-vis "Congress shall make no law (...) abridging the freedom of speech, (...) to petition the Government for a redress of grievances." I'd say that's a pretty fair characterization, in my opinion. Pretty darn spot-on, in fact. The author is Sheila Blair, former Chairperson of the FDIC. She was appointed by GW Bush and previously worked for Bob Dole. She has spent a large amount of time in academia, but has also served in the private financial services sector (with the New York Stock Exchange and the Commodity Futures Trading Commission) and the Federal government (the US Treasury). That may account for the lack of polarization in her positions. What's funny is, Obama, even in the debates, keeps trying to say Romney was FOR the bailouts and he [Obama] opposes them. And that he [Obama] passed law to end bailouts for companies, to "end boom and bust cycles." while also at the same time, prasies his bailouts as a victory...even as it was a huge loss of taxpayer funds, he gave away an American company to a forgien country for, more-or-less, free, and now another is going to start moving production to China. Braineack: DOUBLESPEAK is de rigueur in the political arena. - Get rid of the ties between Fed Res and gov't, i.e. gov't privilege - this will mean the Fed Res will have far less incentive to bail out the "too big to fail"s.
Market competition between central banks and currencies will create competitive pressure to NOT inflate. All the above proposals in the OP are to add regulation to an industry that has become bloated and inefficient precisely due to gov't protection i.e. regulation - the creation of the Federal Reserve and its attendant monopoly powers. A breakup of that monopoly will allow market forces to do their thing. For example, the "too big" institutions do not "need to be broken up". The playing field just needs to be leveled instead of being tilted in their favor - i.e. no bailouts. Then they wouldn't take big risks e.g. high leverage, if they knew they wouldn't get bailed out if it goes pear shaped. For those really interested here's a very good lecture "Do we really need a central bank?" I don't think Sheila Blair is "The GOP" and she is certainly not part of any tea party caucus that I know of. Look at Joe's interpretation of her points: they are all over the political spectrum. [...] For example, the "too big" institutions do not "need to be broken up". The playing field just needs to be leveled instead of being tilted in their favor - i.e. no bailouts. Then they wouldn't take big risks e.g. high leverage, if they knew they wouldn't get bailed out if it goes pear shaped. This is a bit of a chicken and egg issue. It may not be reasonable to remove the bailout backstop from the largest financial institutions without first breaking them up. Joe - One way you could break up the largest financial institutions without, in my view, overstepping constitutional issues is by re-instating the division of investment and traditional banking and the associated FDIC elements. So, basically you want to take away all of the things which allow commerce to function smoothly across a large federation of states. In the past, you have expressed a negative opinion towards those who profit solely from the manipulation and exchange of currencies. I recall one thread in which you posted a parable that portrayed banks as evil, scrooge-like entities which sought to gradually accumulate all wealth for itself by imposing small fees on the issuance of IOUs against deposit (checks) and so on. What you are proposing here would, at the very least, create additional overhead for business who must now handle and exchange many different domestic currencies, and provide an entirely new avenue for banks to profit by providing exchange services on disparate currencies. It would also create an entirely new market for speculating on the currencies of various banks / states, as well as a new form of arbitrage to take advantage of the minute fluctuation in relative value between different currencies. DOUBLESPEAK is de rigueur in the political arena. And also in form-based discussions of monetary policy, from the look of it. Gold will likely regain popularity as a commodity backing for currency because of its inherent features that made it popular in the past as currency. In the presence of competition the Federal Reserve itself may decide to use gold as backing. So having a bunch of privately issued currency backed by say, gold, would mean no fluctuating exchange rates between them. Any costs associated with having competing currencies would be far, far outweighed by the benefits of having a stable banking system and economy. How about watching the video above? It is a very well written and delivered lecture by an economics professor that brings up a lot of great points, ideas, and history. Gold will likely regain popularity as a commodity backing for currency because of its inherent features that made it popular in the past as currency. In the presence of competition the Federal Reserve itself may decide to use gold as backing. One of the features which made gold popular as a currency in the past was stability. Certainly it has moved around a bit, but in the past it tended to follow rather gradual trends. You can see the Great Depression and the two World Wars in there, but apart from those periods of global upheaval, the value did not exhibit unusual or unpredictable trends. Since the late 1970 / early 1980s however, the value of gold has been subjected to extremely radical swings in both the positive and negative directions. Do you really want the economy of the entire nation tied to such a fickle commodity? Bit of a bubble there in '85-86 which corresponded to an actual boom is US GDP and again in 2000-2002 representing the tech bubble, but note that the massive spikes around '78-81 and '08-'10 are absent. This is a much more accurate representation of the ACTUAL VALUE of US currency relative to the world market. So, could we return to a gold standard? Of course. We could peg our currency to the value of cocoa beans if we wanted to. But we'd have to be idiots to do it. This was so funny that I had to make a cartoon out of it. Jason, I know for a fact that you are familiar with the concept of arbitrage, so I cannot even imagine how you managed to post such an assertion without a smiley at the end. If you can produce even one single real-world example (since the industrial revolution) of a situation in which different currencies have been sustainably exchanged in an open market without arbitrage, I will paint my car pink and display a rainbow sticker on the back of it. German peasants carrying around wheelbarrows full of reichsmarks in order to buy a loaf of bread is more like it. Quite the opposite, as I believe I've demonstrated above. Abandoning the single-currency system and moving to a gold-based multiple currency system would be the most de-stabilizing event in the history of the US since the Civil War. Yes, it does. And he is entitled to have his own opinion about such matters. The reason for gold's instability is that it is no longer a currency - this sounds backwards, but if gold were used as currency, you'd actually have the economy (sum of prices of all goods for sale) stabilizing the short-term value of currency (gold). The difference between it and Federal Reserve Notes, is that FRN's have long term depreciation due to inflation (average per year), while gold wouldn't. An ounce of gold today is much closer to the value of an ounce of gold in 1913 (creation of the Fed Res), than the USD does over the same timespan - the USD has been inflated (depreciated) by ~20x. It has lost 95% of its value. In all 3 measures, it has FAILED. From a "Distribution of Knowledge" point of view, it is impossible for the Fed Res to be able to control the money supply better than leaving the market alone. Different day, same argument. You are as predictable as the rash that FaeFlora gets after he visits his "friend" downtown. The reason for gold's instability is that it is no longer a currency - this sounds backwards, but if gold were used as currency, you'd actually have the economy (sum of prices of all goods for sale) stabilizing the short-term value of currency (gold). The fact of the matter, however, is that we are just not as powerful as you seem to assume. Gold is traded in a global market, and so long as the nations of Europe, Asia South America and the Middle East continue to treat gold as a commodity to be speculated upon, they will continue to influence its valuation just as surely as energy demand in the developing nations drives the cost of oil and natural gas. Look back at the charts I posted. You see that huge spike in the price of gold around 1979 followed by the subsequent plummet? Just try to imagine what the repercussions would have been if that was the US dollar. On the upswing, our exports would have ceased completely, and pretty much 100% of domestic production would be outsourced. I don't just mean cars and washing machines, I'm talking about food and coal as well. With the dollar worth three times its value from two years previous, it wouldn't even make sense to manufacture a roll of toilet paper or raise a dairy cow in the US. And then, the fall. In the process of shifting all production abroad, we'd already have put every single farmer, assembly-line worker, coal miner and shipbuilder in the country onto the unemployment roster. So when the dollar cratered in response to the price of gold plummeting back to its pre-crisis value, we couldn't even afford to buy the non-domestic corn and wheat that we'd need to stock the breadlines and soup kitchens that everyone had been reduced to relying upon. And now, you see what's happening to gold again? Some folks may look at this and say "gold is a great investment." Yeah, just like it was in 1980. So no, I don't think that our reverting back to a gold standard is anything but a suicidally insane notion fueled by nostalgic, rose-colored visions of an era in which the US really was the only Big Dog. Just because it ain't perfect doesn't mean that it's worse than the alternative. If the US had been on the gold standard in the late 70s, we would quite simply have gone bankrupt. And unlike Greece and Spain, there's no AU to come and bail us out. I want you to seriously contemplate the ramifications of that. We're not talking about some piddly little global financial meltdown, we are literally talking about World War 3. Last edited by Joe Perez; 11-02-2012 at 09:26 PM. So how has it failed? 1: The US dollar is elastic. 2: Negotiable debt instruments are rediscountable. It's all fine and well for you to believe that the Federal government is responsible for keeping you employed and keeping inflation low. Admittedly, that's an odd point of view for a self-professed libertarian to hold (both employment and inflation should, by that school of thought, be dictated by the market rather than the Fed), but you have the right to your own opinion. This does not, however, make it fact. 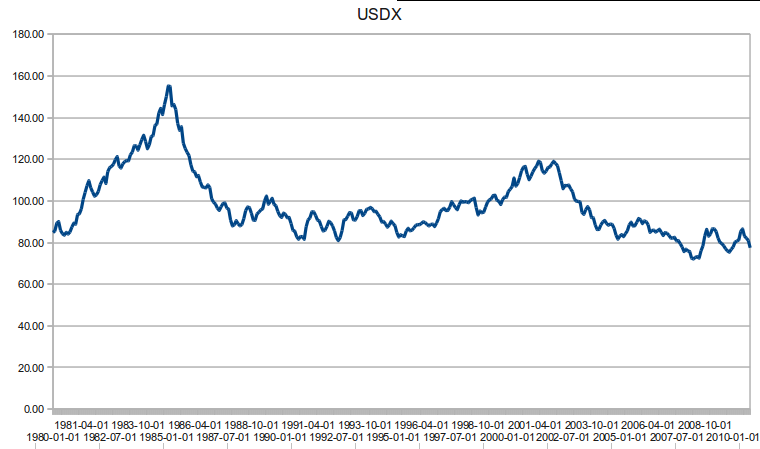 The relative value of the US dollar on the global exchange is exactly the same as it was 30 years ago. How can you possibly argue that the Federal Reserve has failed to control inflation / deflation (which isn't its job in the first place) in light of this simple fact? Your are comparing it against other fiat currencies, and all the central banks of the world like to inflate more or less together. This doesn't nullify the ill effects of inflation. Inflation means that savings shrink in value over time. Makes it harder to save for retirement. Then we have to play stockbroker or investor to beat inflation. Wages, if increased at a rate slower than the inflation rate, will erode over time. Even Keynes said that inflation is available as a means of shrinking wages if central planners deem it necessary. Last edited by JasonC SBB; 11-03-2012 at 01:25 AM. The fact of the matter, however, is that we are just not as powerful as you seem to assume. There are other alternatives to the gold standard. One of them is to simply dissolve the Federal Reserve but keep the USD as legal tender. In such a system the banks will form their own competing central bank reserve systems but without the power to create high powered money ("printing money"). They will compete with each other, and one freedom they would have is setting their own member bank reserve requirements. There would also be no monetization of debt (create money on the spot to buy gov't bonds). Yet another alternative is to dissolve the Fed Res, keep the legal tender laws, and let the US Treasure print some fixed % of money per year, handed over the the gov't and spent into the economy. In either system the way banks of a bunch of banks under a central bank would maximize profit is to set their reserve ratios correctly. Too high and they risk bank runs, too low, and they get a missed opportunity cost. Because there are no gov't bailouts, they will not run such high risks. Competition will limit their profitability to something typical of most industries. In a system of competing currencies, the way for competing central banks that issue currency, to maximize profits is also to set their money supply correctly. That volatility is because gold ceased to be currency, became a commodity, with the attendant swings in prices. Also, the way it stayed low, then shot up then came back down in 1971 was precisely because of US gov't manipulation - the US gov't pegged the USD to gold ratio (despite inflation of the USD, which is/was the world's reserve currency) and foreign governments were allowed to exchange their USD with gold. Because of the inflation, the US gold reserves dwindled, then Nixon unilaterally ended the USD to gold exchange window, the result of which, the USD plummeted in value relative to gold. And rebounded some. So if the USD was on a true gold standard prior to 1971 (i.e. wasn't inflated the way it was), gold and the USD would have remained relatively flat. The correct solution 1913 would have been to get rid of the funny regulations on banks, instead of instituting a central bank. "Twin Mandates": control inflation, and low unemployment. The OP wrote the word "Radical" in the title. The listed proposals for more regulation are not radical (although I agree 100% with "no bailouts", because that is reducing gov't intervention). Calling for more regulation is a continuation of applying patches to a broken system, again due to mis-diagnosis of the problem. Having a bunch of professors and bureaucrats dictate rules on the monetary and financial system is a flawed idea. Imagine having a powerful group dictating how car and aftermarket companies are run and how their products have to be designed. For very complex systems like market economies, biological systems, and networks, de-centralized evolution works much better at finding resilient solutions to problems, than centralized top-down design. Regulations stifle innovation while freedom encourages it. All that is needed is a basic legal framework that punishes fraud and enforces contracts. this Belgian professor explains that the top-down design of the banking, currency, and financial system has created a monoculture. Compared to a more diverse system, monocultures trade off resiliency, for efficiency (which Joe touched on). Just like in nature, monocultures (i.e. huge swaths of single varieties of banana trees) are prone to devastating epidemics / large sudden failures. Diversified systems will feature much smaller, isolated failures. Lietaer laments the near-universal rejection in the academe of alternative theories to central banking and Keynesianism, including Austrian Economics and Scrappy's Chartalism. He calls it a "taboo" in the academe, and you tend to get voted off the island if you start bringing it up. His proposed solution which he has studied in history, is to allow and encourage local "parallel" currencies. IMO historically it worked because most business was done very locally, but in today's geographically diverse business it would be no different than having competing currencies. Lietaer mentions some open source software for local businesses to create a local currency. All I'm hearing are the same couple of ideas which have already failed, repeated over and over again. First off, a gold standard inherently limits economic growth. As actual productivity increases, the money supply must be able to increase as well. As the rate at which new gold can be mined is finite, and a finite money supply leads to deflation. Deflation is bad, mmkay? Deflation significantly discourages borrowing, because it means that loans must be paid back in the future with money that is worth more than it is today. During the Great Depression, deflation averaged around 10% per year, meaning that even a loan with 0% interest had an effective 10% interest rate from the point of view of the debtor. So borrowing pretty much stops. And that's not just homes and cars, it's also borrowing to fund the starting of new businesses, the expansion of existing business, etc. So nobody can grow their business, but that's ok, because nobody can afford to take out a loan to buy anything. Of course, even if there's no deflation, nobody really wants to lend money anyway. At least, not in an environment in which the value of debt is subject to rapid fluctuation based upon the movement of a commodity. You can speculate about ways in which long-term fluctuations in the price of gold can be damped, but it has always experienced short-term spikes and dips. Always. No reason for private investment either. Who wants to make long-term investments with an expectation of reduced future earnings due to decreased prices? And about that hypothetical 0% interest rate? Yeah, that's not good either. You know all that talk you hear about the Fed hand-wringing over whether to adjust the short-term interest rate? They're not just flapping their lips. Whether you like the concept of the Federal Reserve or not, the fact is that interest rates are a valuable tool for adjusting the pace of the economy as a whole. You're an engineer, so you can appreciate the futility of trying to turn a **** that's already set to 0. Adherence to the gold standard, in fact, significantly prolonged the Great Depression and increased its severity. Once all of the money had been hoarded, there simply was no more. And like the 2008 global slump, the Great Depression was also an international phenomenon. Bet you weren't considering one very curious fact: It's no surprise that the UK bounced back far more rapidly than the US. Why? They abandoned the gold standard in 1931. There are a number of very valid reasons why most of the world's industrialized nations departed from the gold standard right about the time size of a regional market stopped being defined by the distance which a horse can travel in a day. It took certain countries longer than others to realize the benefits inherent, and we paid for that lack of vision dearly. But if it's a barter-based agrarian civilization that you want to go back to, I hear there's some undeveloped land in northwestern Ontario where some like-minded folks are setting up a new commune. I advise you to learn blacksmithing. But wait! What about a fractional-reserve gold system? And hey, while we're at it, let's incorporate your other idea and let individual banks print their own notes, and we'll just limit oversight to making sure that they don't exceed their reserve limits. Well, aside from having no more inherent credibility than a pure fiat standard, you've just defined "gun" in the sense of "a tool which allows one to shoot one's self in the foot. See, in a fiat system, it doesn't matter what happens to any given bank. A dollar is a dollar, so let 'em fail. **** 'em. No bank is too big to fail, right? So what's the first thing that happens when faith in a certain bank wavers? People start to demand their gold. Except that the bank doesn't have enough gold to cover all the notes, so it folds. And because there's no unified federal reserve note, all of the paper that the bank left behind- all those notes that are actually in in people's wallets and cash drawers- is suddenly worthless. Would you be in favor of expanding the size of the FDIC to cover not merely deposits, but every single bank note in circulation? I am very eagerly awaiting your reply, which I expect to completely ignore every point I have put forward here and either go off on some unrelated tangent or just re-state the same unrealistic claims again.